Witnessing a driver's behavior firsthand can provide essential information to help you increase fleet safety and reduce risk. 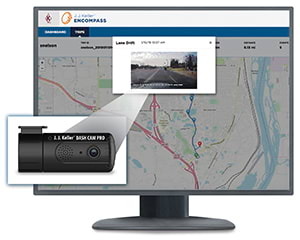 The new J. J. Keller® Encompass® Video Events Manager and Dash Cam Pro – available April 2019 – provide a way for fleet managers to do just that. The Encompass Video Events Manager also delivers in-depth driver and event analysis, reporting and trends. Bringing video performance to Encompass, the most comprehensive system for managing driver qualification and compliance, puts it in a class by itself. Encompass now keeps over 11,000 fleets and 350,000 drivers safe and compliant. To learn more about Encompass Video Events Manager, fill out the form on the right, and a safety & compliance specialist will contact you.